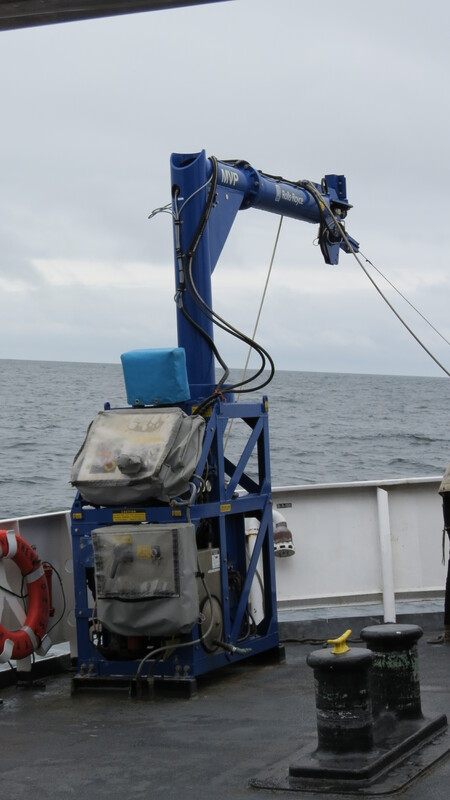 NOAA Ship Fairweather uses a multibeam sonar to map the ocean floor. Sonar stands for SOund Navigation And Ranging. This ship’s multibeam sonar sends sound (acoustic energy) to the seafloor in a fan shape, and then listens for the echos. The speed sound travels is vital to knowing the depth the sound has traveled to. Sound travels about 1500 meters per second in seawater. This is much faster than in air where it travels at about 340 meters per second. Sound speed is an important consideration in ocean floor mapping. Spreading – As the sound energy gets farther from its source (the bottom of the ship) and after it hits its target, the sound wave gets weaker. This is why you can hear someone standing next to you better than somebody on the other side of a room. Absorption – The energy of the wave heats up the molecules of water it goes through because of friction and loses energy. This is also the reason you can hear someone standing next to you better than somebody on the other side of a room. Ambient Noise – . This refers to the fact that the fish, (towed behind the ship) the ship, and wave action are also producing sound sources of their own. The sound “signal” needs to be extracted from this “noise”. Target Strength – If the seafloor is muddy, some of the energy of the sound beam will be absorbed and less will be sent back to the ship. If it is a rocky bottom, the sound energy scatters in different directions and a weaker signal returns. How is the sound speed measured? When you hear MVP in sports? MVP means Most Valuable Players, but on NOAA Ship Fairweather the MVP stands for Moving Vessel Profiler. The MVP consists of a small crane on the fantail (the back deck on the ship) that pulls what is called a FISH! The MVP has a computer controlled winch that can be used while the ship is moving. The surveyors (marine technicians) call to the bridge to ask if they can, “take a cast.” This means they will lower the “fish” to get readings and learn the speed of sound for the area. The bridge, which is where the boat is steered from, will respond that they may cast, only if it is safe. 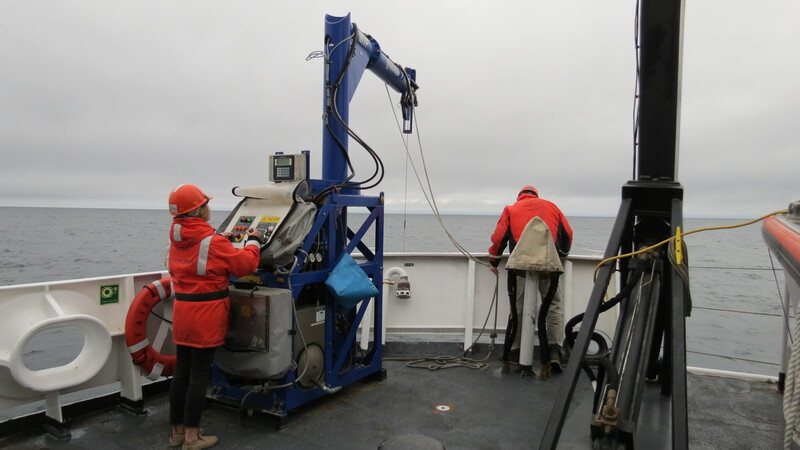 Our last “cast” measured the water column down to 217 meters as we were travelling at 6 knots (about 7 miles per hour.) The ship does not drop the “fish” while it is travelling at a high speed because that puts too much tension on the cable. 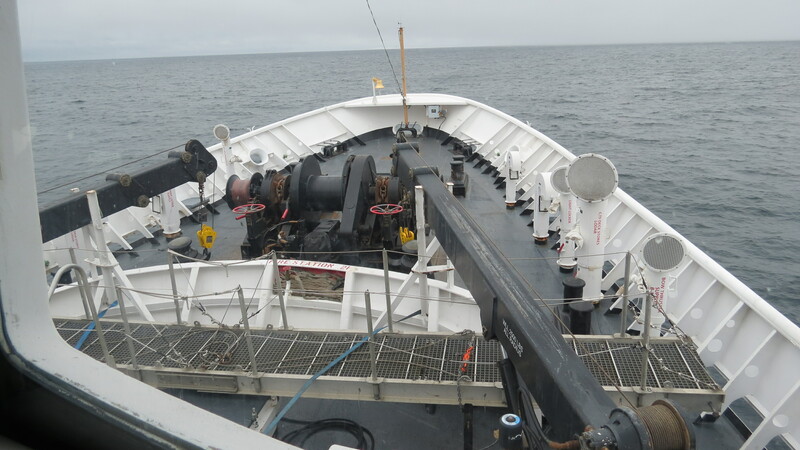 The fish is the instrument that is pulled behind the ship, that collects data. The fish is actually a science instrument, much like the Hydrolab that we use at school. It is a CTD, and is used to measure conductivity, temperature and pressure. 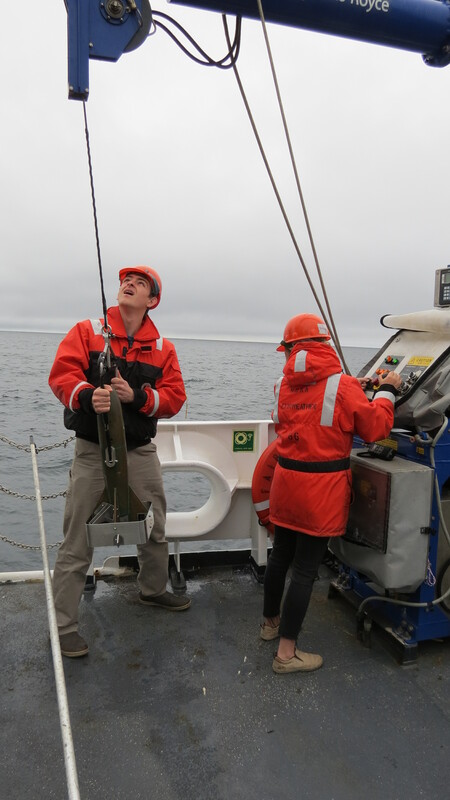 This data allows the CTD to measure the speed of sound. Conductivity is a measurement of the ability of water to conduct an electrical current. The dissolved salts in the water are the conductors of the electricity. The salts, as you may remember, come from the breakdown of rocks and are carried by rivers to the ocean. These “salts” are electrically charged ions, mostly in the form of sodium and chlorine. So, the conductivity measures the salinity (saltiness) of the ocean. This is very important, because the salinity affects the speed of sound. 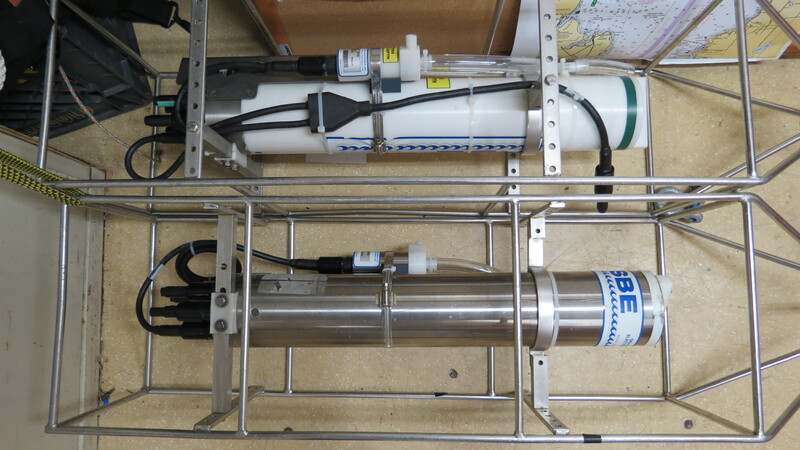 Since the sonar is sending sound to the bottom of the ocean, conductivity or salinity measurements are very important. As sound travels through different densities (caused by the salinity) it causes refraction. You have seen refraction when you put a straw in a glass of water. The straw appears to bend. So the salinity of the water needs to be measured using the conductivity instruments in order to account for different densities caused by the salinity levels. Here is the fish out of water! Temperature also affects the density of the water. Colder water is more dense than warmer water. Remember when we studied how colder air is more dense than warmer air? 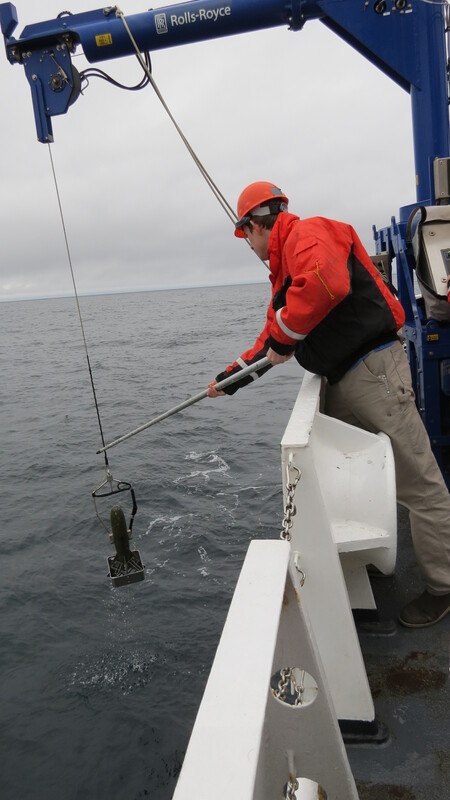 Since salinity and temperature change with depth, the CDT also measures depth. All three of these instruments together help determine the speed of sound through the water. Since the sonar uses sound to map the ocean floor, measuring the speed of sound is vital for collecting good data. The speed of sound generally increases with an increase of temperature, salinity or pressure. These are two CDT’s (Conductivity, Density and Temperature) that can be used if the ship is not moving. They sure look like our Hydrolab! Datum – a noun meaning a piece of information, while data is plural. Transducer – where sound leaves from. Receiver – where the sound comes back to. Today we saw group of Dall’s porpoise. They are very fast moving porpoise. 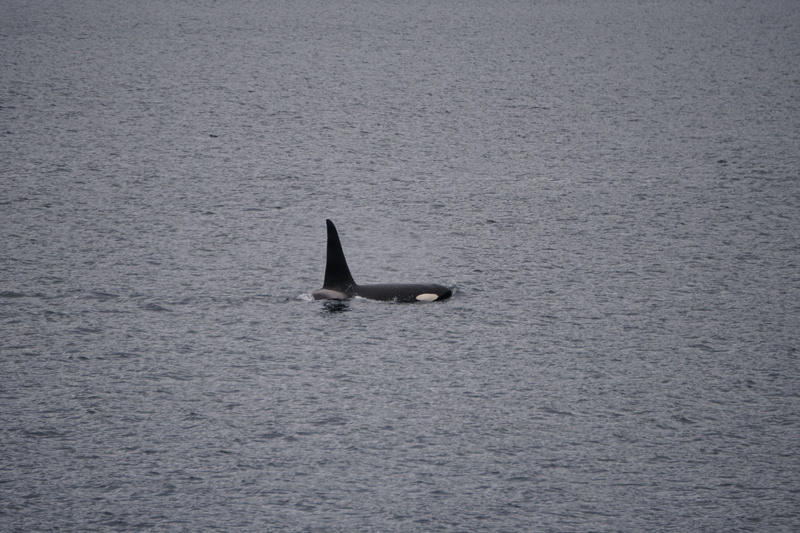 They are found in the Northern Pacific Ocean in groups of 2-20 and can live 15-20 years. Individuals are about 7-8 feet long. 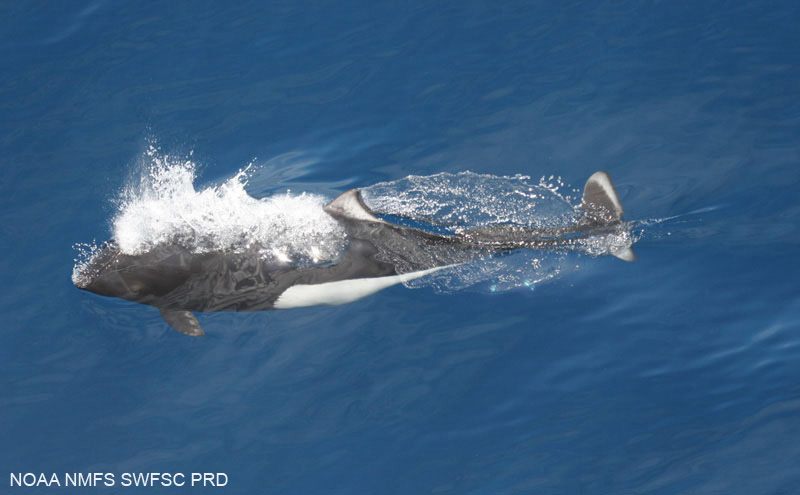 “Dall’s Porpoise (Phocoenoides Dalli).” NOAA Fisheries, National Oceanic and Atmospheric Administration, 15 Jan. 2015, http://www.nmfs.noaa.gov/pr/species/mammals/porpoises/dalls-porpoise.html. 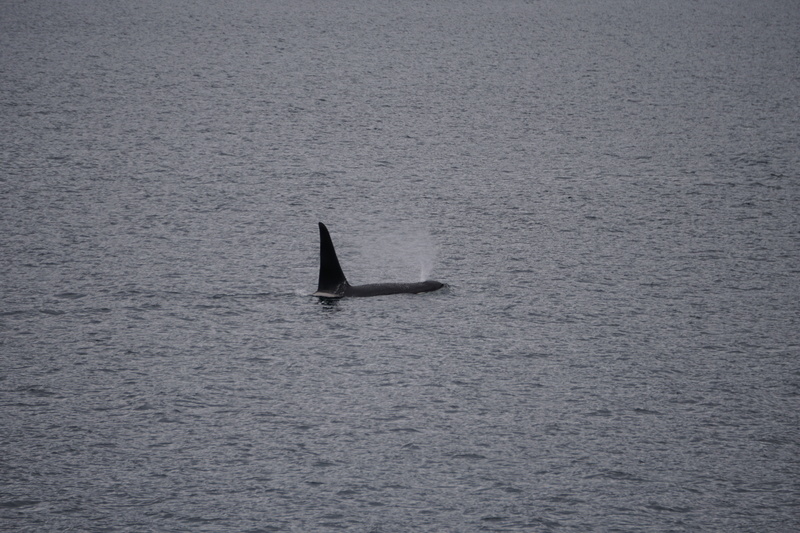 This entry was posted in 2018, Cynthia Byers, NOAA Teacher at Sea and tagged Alaska, Alaska. 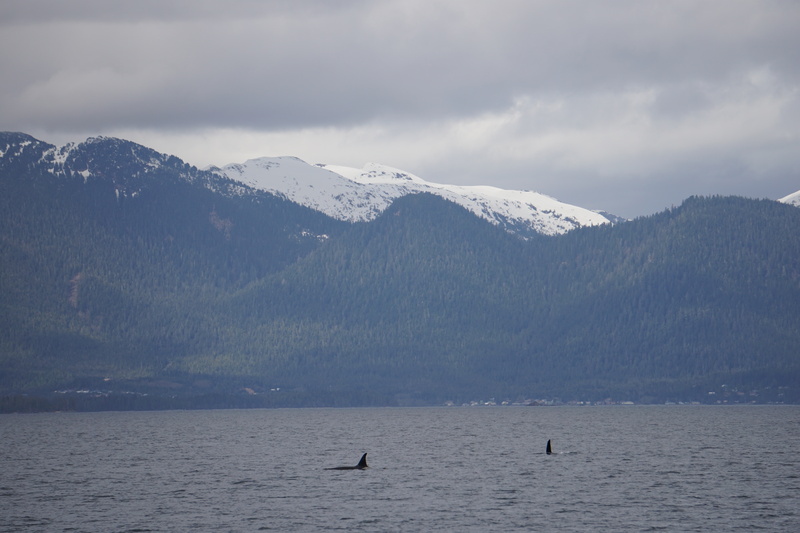 Orcas, Mapping the ocean floor, NOAA, NOAA Ship Fairweather, orcas. Bookmark the permalink. Cindy, enjoying the photos of the marine mammals ! Enjoying your marine mammal photos !